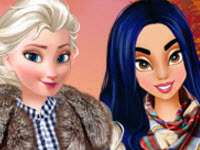 Princesses Elsa and Jasmine are fierce fashionistas and they are unstoppable in their hunt for hottest trends! Vintage furs, military jackets, mid-length skirts, 70s plaid – what else is in trend this autumn? Join the princesses in their shopping haul and find out all the must haves of autumn-2017!